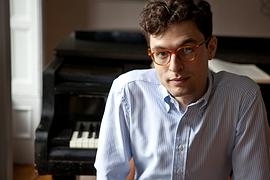 Timo Andres is a composer and pianist who grew up in rural Connecticut and now lives in Brooklyn, NY. Recent works include a piano quintet for Jonathan Biss and the Elias String Quartet, commissioned and presented by Wigmore Hall, Carnegie Hall, the Concertgebouw Amsterdam, and San Francisco Performances; a solo piano work for Kirill Gerstein, commissioned by the Gilmore Foundation; and a new string quartet for the Library of Congress premiered by the Attacca Quartet. As a pianist, Timo has performed solo recitals for Lincoln Center, Wigmore Hall, (le) Poisson Rouge, and San Francisco Performances, and appeared as a soloist with the Los Angeles Chamber Orchestra and the Orpheus Chamber Orchestra, among others. Home Stretch, an album of Timo’s orchestral works, was released in July 2013 by Nonesuch Records.